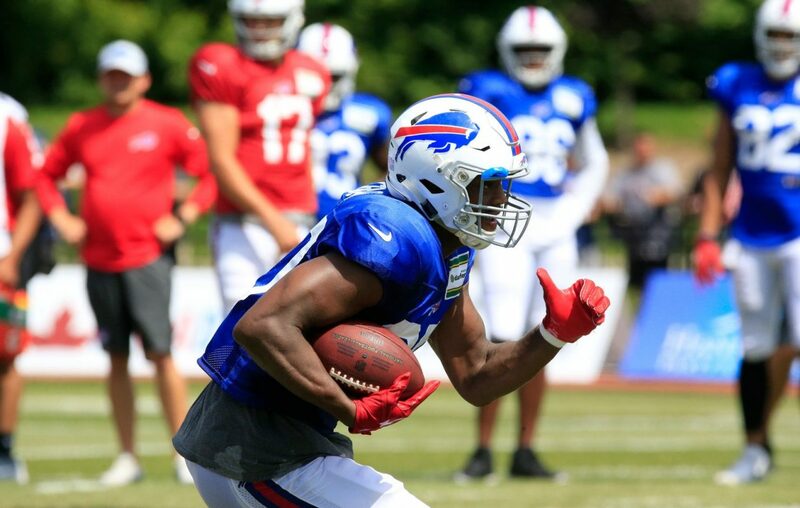 The Buffalo Bills don’t have a hole at their starting tight end position – yet. Charles Clay and his $9 million salary still occupies that spot, but that’s not expected to be the case for long. If Clay is released, the Bills would save $4.5 million against the 2019 salary cap, a move that looks like a no-brainer after the veteran finished with just 21 catches for 184 yards and no touchdowns in 2018. It’s the first time in Clay’s eight seasons that he went without a touchdown, and his yardage was also the lowest of his career. So his release feels inevitable, but leads to a big question: Who’s going to replace him? If the answer is on the current roster, it will be Jason Croom. The first-year pro put up better numbers than Clay in 2018, finishing with 22 catches for 259 yards and one touchdown. It remains to be seen, though, whether that’s enough to convince the coaching staff that Croom is ready for an expanded role. Croom had never played tight end until the 2016 season with the Volunteers. He got the idea while rehabbing a knee injury that cost him the previous year, and head coach Butch Davis was all for it. At 6-foot-5 and 246 pounds, Croom has prototypical size for a tight end. He’s also fast enough, running a 4.69-second 40-yard dash at Tennessee’s Pro Day in 2017. One thing you can bet on: Croom’s going to put the work in to get better. Since signing as an undrafted free agent with the Bills, he’s consistently been one of the team’s hardest workers. It’s not uncommon to see him on the field long after practice has ended, catching balls from the JUGS machine or working one-on-one with Boras on his blocking technique. Croom’s biggest opportunity to do just that came in Week 16. When the Bills made Clay a healthy inactive against the Patriots, it both signaled the end of his career in Buffalo was likely near and felt like an audition for Croom. A few days later, before the season finale against the Dolphins, Croom looked at the big picture. Croom made it clear then that he knows the last thing he can afford to be this offseason is complacent. Croom took a big jump from the practice squad in 2017 to playing in 15 games last year, but the leap to becoming a full-time starter might be even bigger. “That (trust) is something that's going to build over time. Any time the ball comes your way, are you making plays on it?” he said. “Sometimes it's going to be the ones that everybody expects you to make, but that's the kind of stuff that builds that trust. It's not even with the ball being in your hand. It's without it. Are you springing a big run? I want to be everything. If Croom does earn the starting job, it won’t be handed to him. With just one other tight end on the roster (not counting Clay) in Logan Thomas, the Bills will certainly be adding to the position. That could mean in free agency, through the draft, or a combination of both. The free-agent class is headlined by Oakland’s Jared Cook, who set career highs with 68 catches for 896 yards and six touchdowns. He’s older at 31, but is still productive. If Cook is out of the Bills’ price range, there are expected to be plenty of cheaper options. Baltimore’s Maxx Williams is a former second-round draft pick who never reached his potential with the Ravens, but is still young (24) and might need a fresh start. Kansas City’s Demetrius Harris will likely be looking for an opportunity for more playing time given that he’s stuck behind Chiefs star Travis Kelce. Pittsburgh’s Jesse James is also No. 2 on his team’s depth chart, behind Vance McDonald. James finished 2018 with 30 catches for 423 yards and two touchdowns. Then there’s the Cincinnati trio of Tyler Eifert, Tyler Kroft and C.J. Uzomah – all of whom are scheduled for unrestricted free agency in March. Uzomah set career highs with 43 catches for 439 yards and three touchdowns, playing in all 16 games for the first time in his NFL career. He took over as the starter after injuries to both Eifert and Kroft. Eifert might be the most talented of the bunch, but has played in just 12 of a possible 48 games because of injuries dating back to the start of the 2016 season. Kroft likewise missed most of 2018 because of a foot injury, so he would come with injury concerns of his own. If the Bills turn their attention to the draft, they could be in luck. It’s perceived to be a strong year for tight ends, starting with the Iowa duo of T.J. Hockenson and Noah Fant, both of whom are considered borderline first-round talents. That’s rather remarkable from the same program. Alabama’s Irv Smith Jr., Georgia’s Isaac Nauta, Stanford’s Kaden Smith, Texas A&M’s Jace Sternberger and UCLA’s Caleb Wilson are also considered prospects who could go in the first two days of the draft (rounds 1 through 3). Depending on the investment made, Croom could find himself in a heated competition for the starting job. Either way, though, he’ll have a chance to prove he can become more than just a contributor.